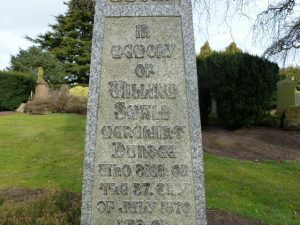 William Small, flax merchant, was long known as a public man in Dundee. One of the sons of William Small, a Town Clerk, he, along with his brothers David and Robert, were active in the affairs of the town. It was declared that William Small had been brought up to the Cowgate business, the Cowgate being the location of a great number of Dundee merchants. He first appears in the Dundee Directory in 1842-43 (at which point he would have been approximately 27). He was listed as a merchant and also an agent for the Glasgow Marine Insurance Company, operating from 18 Cowgate. His next listing has an additional entry as, not only a merchant, but also a shipowner. William's ship owning associations linked him to the barque 'Richard Cobden' and the brig 'Sir James Kempt'. However, it would appear that ship owning was not always plain sailing. The barque 'Richard Cobden', having sailed from Calcutta on 09-09-1850 with a cargo of sugar, cotton, safflower, jute etc. came to grief approximately 50 miles from the island of Bourbon. On 22-10-1850, the cargo of safflower had combusted spontaneously and, within a few hours, she was burnt to the water's edge and sunk stern foremost. Happily, the entire crew was rescued and taken aboard 'The Prince of Orange' of Leith, and set down on the island of St Helena. Happily too that the ship and cargo were fully insured. Neither did the large brig 'Sir James Kempt' escape trials at sea. In 1850, when William Small was listed as its owner/agent, it had to be run ashore about 20 miles from Santiago de Cuba having become leaky. Part of the cargo (about 150 tons of logwood) was saved. It is less clear whether William Small still had links to both ships at that time (in 1850, he was still linked with 'Sir James Kempt') although, if not, perhaps he may have acted as the insurance agent. For a short period (circa 1853-54), William Small joined in business with Thomas Neish, a long established merchant, dealing in flax and other Russian produce. After that point, William's career as a flax merchant was to be on his own account. William Small was merely a child aged seven years when his father William Small (Town Clerk) died in 1822. His mother Charlotte (Baxter) was left to raise a family of six, by herself, within the family home of Edenbank, West of Springhill, on the Ferry Road. Doubtless, she had additional support from her extended Baxter family – her brothers being John (of Idvies) and William (founder of Baxter Bros). Perhaps the most notable of William’s siblings was David, the eldest son, who became a prominent writer (solicitor) and Procurator Fiscal within Dundee. William, and his brothers Robert and Henry, all became merchants of the town. 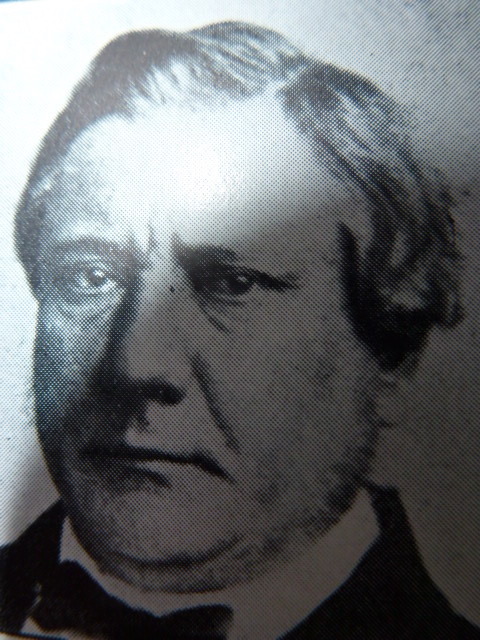 A brother James was resident in Canada at the time of his mother’s death in 1860. His sister Margaret married William Collier, also a merchant. William Small’s public life took many guises. He held a deep interest in many of the town’s most important and charitable institutions and took a lively interest in everything connected with the trades and manufactures of the town. It would appear also that he was proficient in organising and negotiating for major events. As a representative of the flax and jute trade for Dundee Chamber of Commerce, he attended meetings in Paris at the time Richard Cobden (a Radical and Liberal statesman, associated with two major free trade campaigns) was in talks which led to a commercial treaty and free trade agreement with France. It was further reported in the press that ‘a meeting of gentlemen connected with the linen trade in the Counties of Forfar and Fife was held in the Royal Exchange Reading Room in Dundee for the purpose of recording their thanks to Mr Cobden MP and to the deputation from Dundee for their exertions in connection with the lately concluded commercial treaty with France’. 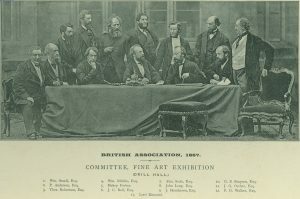 In addition, Oliver Gourlay Miller proposed ‘that some special recognition of Mr William Small’s long-continued and valuable services be made’ and William Warden Renny remarked that ‘the best thanks of the meeting are tendered to Mr William Small, Mr William Cox and Mr James Fairweather, the members of the deputation to Paris’ who liaised with Mr Cobden. In recognition of his services there, William Small received a valuable testimonial on his return. Subsequently, he was elected Chairman of the Chamber of Commerce, and marked his term of office by giving a brilliant ‘conversazione’ in the Kinnaird Hall. The name of Richard Cobden appears a number of times in association with William Small. 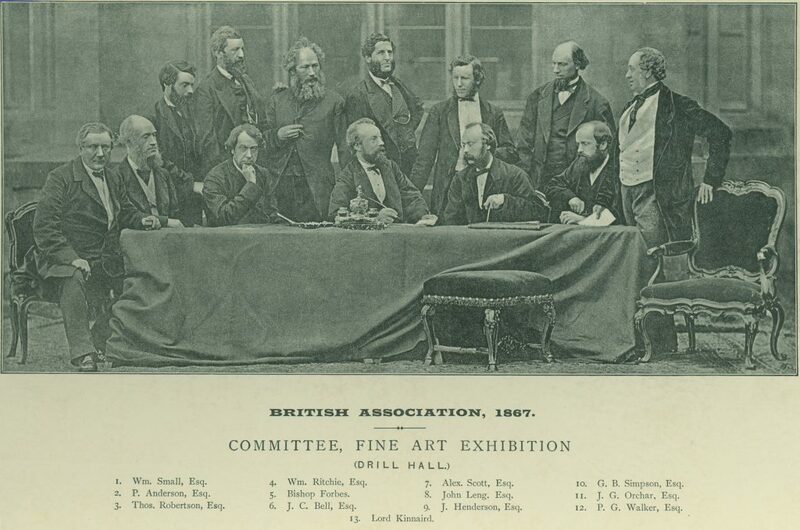 In 1844, William was a member of the platform (along with many Dundee dignitaries, manufacturers and merchants at a tea soirée held in Edinburgh, where Messrs Richard Cobden & Moore were addressing the audience under the banner of their ‘Anti Corn Law League’. It was around this time too that William’s name appears in the Dundee Directory as being owner/agent of the barque “Richard Cobden”. It could be assumed that William was a supporter of the fellow and his causes. 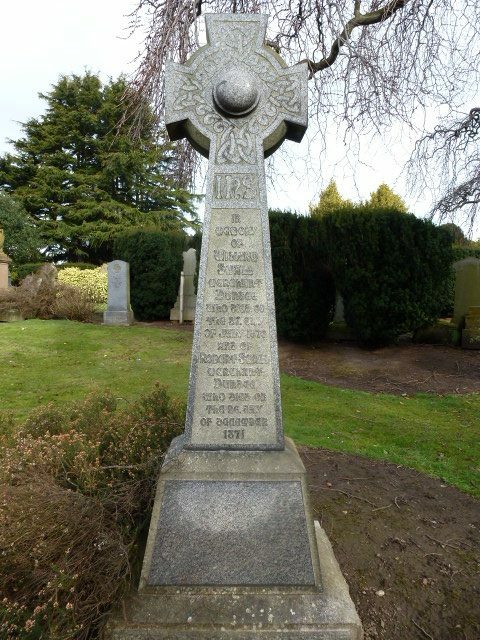 William Small was very prominent in the movement for recognition of the services of Sir David Baxter. In his role as General Superintendent and Grand Marshall for the opening of Baxter Park, William was also credited with securing the attendance of Earl Russell (a prominent Liberal statesman and former Prime Minister), along with other distinguished noblemen and gentlemen who were present. After attending the opening ceremony at the inauguration of Baxter Park, (on which occasion Earl Russell was presented with the freedom of Dundee), the pomp and ceremony of the day came to a shuddering halt when, on the way home to his residence at Meikleour House, Earl Russell’s coach came to grief in Coupar Angus – how the mighty fall. The postilion was hurt in the event but recovered well enough to resume the journey. During that time too, William struck up a friendship with sculptor Mr John Steel who modelled the statue of Sir David Baxter. This friendship prompted Mr Steel to present William with his own marble bust as a fitting tribute. In 1864, it was reported that, ‘on visiting Mr Steel’s studio in Edinburgh, we had the pleasure of seeing Mr Steel giving the finishing touches to his bust of our townsman, Mr William Small. The likeness is admirable – it is Mr Small to the life and in his best mood. As an evidence of Mr Steel’s personal regard and friendship, it will be all the more valued, while it will also be a pleasing memento of the part which Mr Small took in the opening of the Baxter Park’. In his role as Chairman of the Horticultural Society, William Small did much to secure the success of the magnificent flower show which was held in Baxter Park during the visit of the British Association to Dundee. As a principal promoter of the Albert Institute, it was reported that William obtained donations from influential friends, amounting to several thousands of pounds, towards the completion of the building – no doubt bringing his sound, persuasive negotiating skills into use once more. Described as being of a genial and kindly disposition, not to mention – the life and soul of the party, William Small’s contributions to the commercial and public affairs of Dundee were manifold. The decade of the 1860s sounds, for him, to have been the zenith of an active involvement for the betterment of civic life in Dundee. The information above about William Small has been collated from a range of digital and hard copy sources. To the best of our knowledge it is correct but if you are relying on any information from our website for the purpose of your own research we would advise you to follow up the sources to your own satisfaction. If you are aware of an inaccuracy in our text please do not hesitate to notify us through our Contact page.